Birthday Oreo? Cookies is rated 4.8 out of 5 by 53. Rated 5 out of 5 by Greenmomma from Great Costumer Service We live in Arizona and unfortunately the order arrived with all the chocolate melted because the mail driver just left it outside until I saw it. When I called the costumer sevice they were extremely helpful and friendly, re-send a new order this time w special notes as a ice pack. Very pleased with the products, the cutest gift I could give. Rated 5 out of 5 by Geri1234 from Great birthday gift I sent these to my lil sister who is very picky with her candy. She absolutely loved these. Rated 5 out of 5 by RickB from Perfect! Always a great selection. Never fails to bring a smile on the other end. Always delivered as promised. Rated 5 out of 5 by Marianne02906 from Great gift! Ordered these for a celebration dinner in another state. Requested a delivery date. They arrived at the hotel on schedule. They were fresh and were wrapped well to protect the design. Very satisfied. Rated 5 out of 5 by Happycustomer1234 from Excellent customer service I sent these to my sister in the hospital but gave them the wrong address. When I called customer service the day it was supposed to ship, they were able to track down my order and the cookies were delivered to the correct hospital the next day. Rated 5 out of 5 by Morgan S from Great Birthday Surprise I’ve ordered these twice now- everybody loves them! Rated 5 out of 5 by Birthday boy from Son loved it. Sent it to my so. For his birthday. “Fancy Oreos” but then he loves Oreos. His re Jew was quite positive...for him!! Say Happy Birthday in the sweetest way with 14 Belgian chocolate drenched Oreo® cookies! 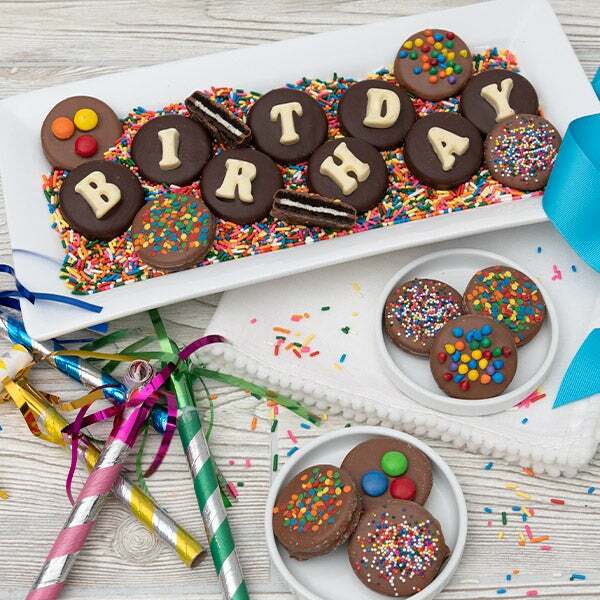 These sinfully delicious cookies are first dipped in milk, dark and white Belgian chocolate and then embellished with sweet sprinkles, fun chocolate candies, and white chocolate letters that spell out BIRTHDAY. Surprise someone special and sweeten up their birthday!